You are handed a list of VMs to delete from disk. Problem – Some VMs may still be powered on. Some my have -decomm or other text after the VMs name in vCenter. # Your textfile of VMs can have an * at the end in case someone added -decomm to the end. $vCenter = Read-Host "Enter the FQDN of your vCenter"
$textfile = Read-Host "Enter the path to the list of VMs ex. 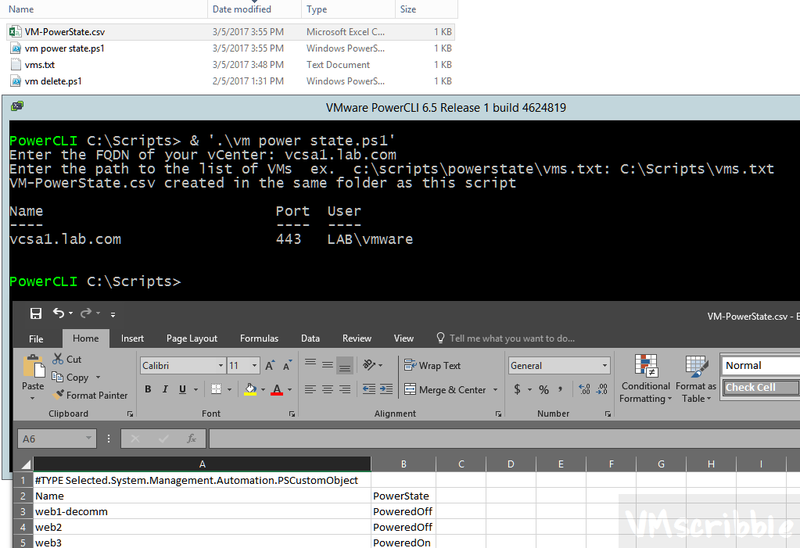 c:scriptspowerstatevms.txt"
Write-Host "VM-PowerState.csv created in the same folder as this script"
Get-VM $listofvms | select Name, PowerState | sort Name | Select Name, PowerState | Export-csv -Path "VM-PowerState.csv"
You will see the “web3” power on VM error our. $textfile = Read-Host "Enter the path to the list of VMs ex. c:scriptsdelete-vmsvms.txt"